You want to burn all of the gas in the cylinder. If the design leaves any of the gas unburned, that is untapped energy. You want the maximum cylinder pressure to occur when the crankshaft is at the right angle, so that you extract all of the energy from the pressure. You want to waste as little of the engine's energy as possible sucking air and fuel into the combustion chamber and pushing exhaust out. You want to lose as little heat as possible to the heads and the cylinder walls. Heat is one of the things creating pressure in the cylinder, so lost heat means lower peak pressures. The last item in the list is one of the key advantages of the HEMI head versus the flathead engine. Surface area causes heat loss. Fuel that is near the head walls may be so cool that it does not burn efficiently. With a flat head, the amount of surface area relative to volume of the combustion chamber is large. In a HEMI engine, the surface area is much smaller than in a flat head, so less heat escapes and peak pressure can be higher. Another factor with a HEMI head is the size of the valves. Since the valves are on opposite sides of the head, there is more room for valves. The engine design that preceded the HEMI was a wedge-shaped combustion chamber with the valves in line with each other. The inline arrangement limited valve size. In a HEMI engine, valves can be large so the airflow through the engine is improved. The HEMI Magnum engine has two valves per cylinder as well as two spark plugs per cylinder. The two spark plugs help to solve the emission problems that plagued Chrysler's earlier HEMI engines. The two plugs initiate two flame fronts and guarantee complete combustion. If HEMI engines have all these advantages, why aren't all engines using hemispherical heads? It's because there are even better configurations available today. One thing that a hemispherical head will never have is four valves per cylinder. The valve angles would be so crazy that the head would be nearly impossible to design. 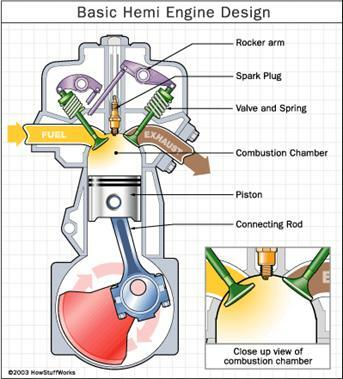 Having only two valves per cylinder is not an issue in drag racing or NASCAR because racing engines are limited to two valves per cylinder in these categories. But on the street, four slightly smaller valves let an engine breath easier than two large valves. Modern engines use a pentroof design to accommodate four valves. Another reason most high-performance engines no longer use a HEMI design is the desire to create a smaller combustion chamber. Small chambers further reduce the heat lost during combustion, and also shorten the distance the flame front must travel during combustion. The compact pentroof design is helpful here, as well.